Woah now. What is this? 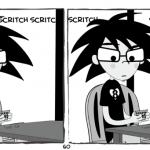 I am back at school, and thus the comics return after a long hiatus. This comic may not seem funny to you. That’s because I’m trying something new. I have an actual story to tell you guys, and I do hope you’ll enjoy it. There will of course be humor, and of course I will still do one shot jokes. I just want to do something a little more narrative than before. If you readers (all three of you) find it in bad taste though, let me know and we’ll return to the status quo. For now though, Part 2 begins with a lotto ticket, three months after we last left our protagonists.